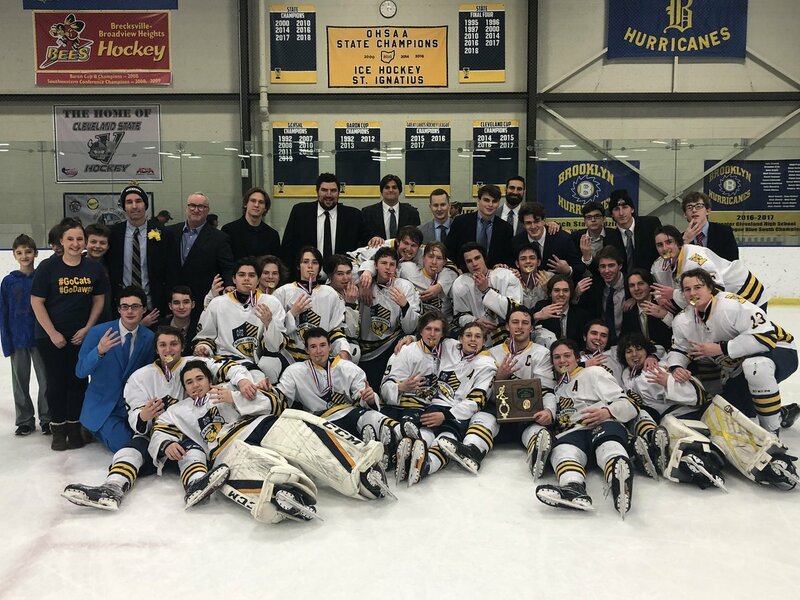 The St. Ignatius Wildcats earned a final four birth in hockey on Saturday, as they took care of business in Brooklyn, shutting out Holy Name 6-0 to win the Brooklyn District. Going to Columbus is nothing new for Iggy, as it’s the 10th time they have earned the right to play in the state’s capital with a chance to win a state title. The 25-10-0 Wildcats will now play Sylvania Northview Friday at Nationwide Arena in Columbus. Saturday was a script seen all too often by teams trying to take down the Wildcats, a period dominated by Iggy as they put up 21 shots on goal, and they were able to finally get on the board with 4:04 left in the first when junior Michael Boehm scored to make it 1-0. It was the only goal they would need, but they added five more, as junior forward Alex Bilardo made it 2-0 before the end of the first. The Green Wave were not able to crack through to score a goal, despite having a couple chances on the power play in the second period. St. Ignatius senior captain Benny Savarino made sure to secure the shutout for the Wildcats. Ignatius put the game out of reach in the second period with goals from Aidan Conway, Aidan Millett and Joey Trobenter. The impressive season for Holy Name ends at 24-10-4, and they also were able to win their first ever Cleveland Cup. The Wildcats have another shot to take home a state title, and it’s hard to imagine they won’t get the job done next weekend. In a show of true class and sportsmanship after the win, the Wildcats had Olmsted Falls senior hockey player MacKenna Wertman join them on the ice for their team photo. Wertman, a brain cancer survivor, made news last week when she scored her first, and only, high school goal in the final seconds of the Bulldogs 6-1 loss to the Wildcats, a story that won the hearts of many.